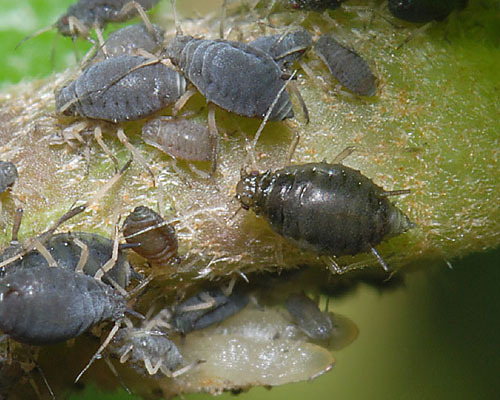 The apterae of Aphis hederae (see first two pictures below) are dark greenish or reddish brown although immatures are paler. They are supposedly not waxy, although the immatures here appear to have a wax 'bloom'. The abdominal sclerotic pattern is mostly confined to a band on abdominal tergites 6-8. 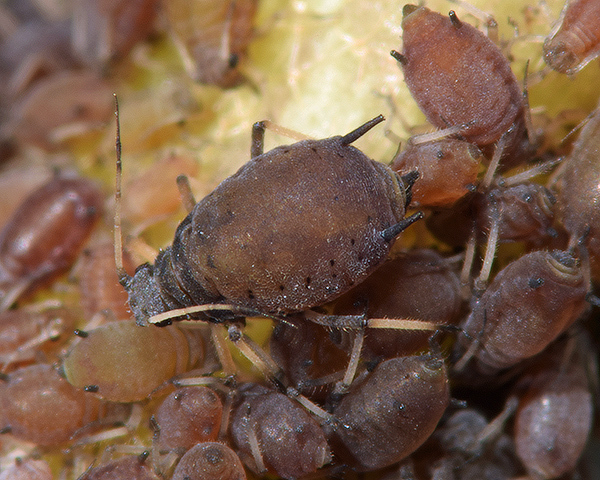 The body length of Aphis hederae apterae is 1.4-2.5 mm. The alate (see image below) has strong transverse dark bands on most tergites. The ivy aphid does not host alternate. It feeds on ivy (Hedera helix) living on the young shoots and foliage (Stroyan, 1984). 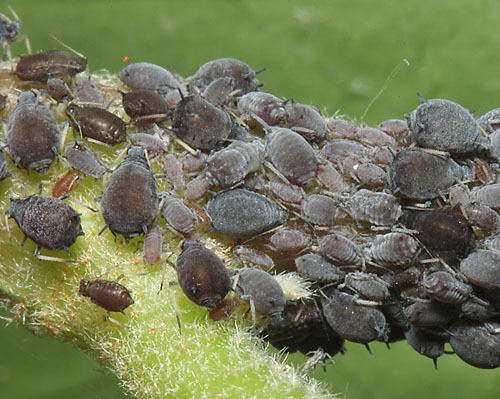 Aphis hederae can also be found on various house plants in the Araliaceae such a Fatsia and Schefflera. Sexual forms occur in autumn with apterous or alate males. It occurs throughout Europe, the Middle East and parts of Asia. It is also recorded from North America, South Africa and New Zealand. Aphis hederae is common and widespread in Europe on ivy growing on old walls and on trees. 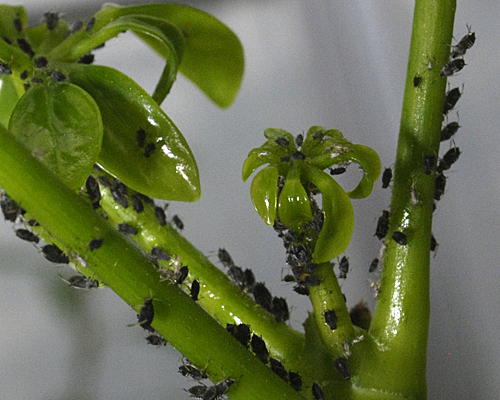 It can also be a pest on various house plants as shown below on an octopus tree (Schefflera umbellifera). 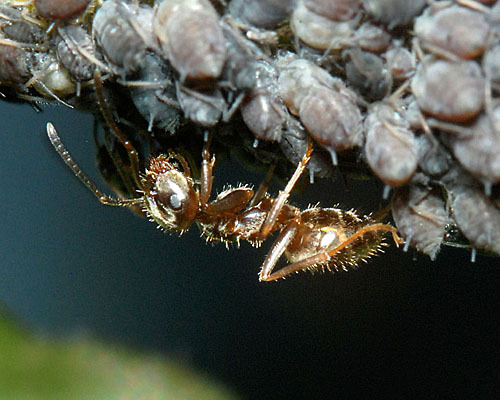 Aphis hederae is facultatively attended by ants, in our experience most commonly by Lasius species. 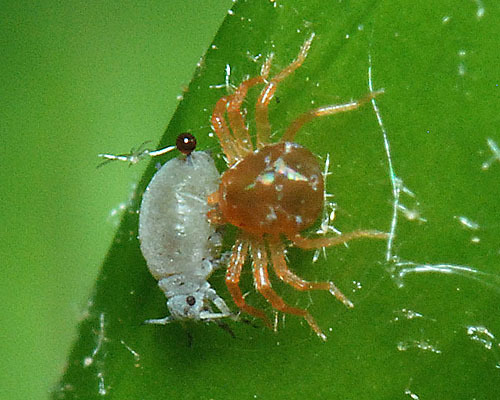 The only predator we have encountered is a predatory mite - possibly an Anystis sp. (see picture below). 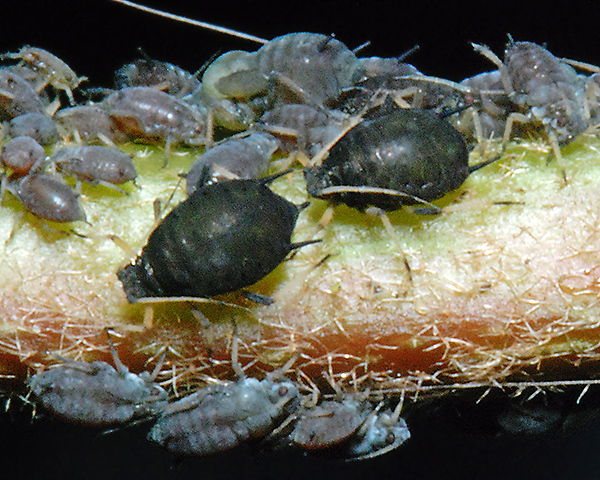 The apparent scarcity of aphid-specific predators may result from the toxicity of some members of the Araliaceae (Maharaj et al., 2008). In addition the presence of generalized predators may disrupt biological control by other more specific natural enemies (Messelink et al., 2011). Aphis hederae is parasitized by several species of braconid parasitoids such Binodoxys acalephae, Binodoxys angelicae and Lysiphlebus confusus (Kavallieratos et al., 2004), but we have yet to find any mummies. Parthenogenetic reproduction may continue through the winter in mild spots but normally in the autumn sexuales appear as shown below. These are oviparae found at the end of September. Blackman & Eastop list 12 species of aphid as feeding on ivy (Hedera helix) worldwide, and provide formal identification keys. Of those aphid species, Baker (2015) lists all 12 as occurring in Britain: Aphis craccivora, Aphis fabae, Aphis gossypii, Aphis hederae, Aphis spiraecola, Aulacorthum solani, Macrosiphum euphorbiae, Myzus ascalonicus, Myzus ornatus, Myzus persicae, Neomyzus circumflexus and Rhopalosiphoninus staphyleae.